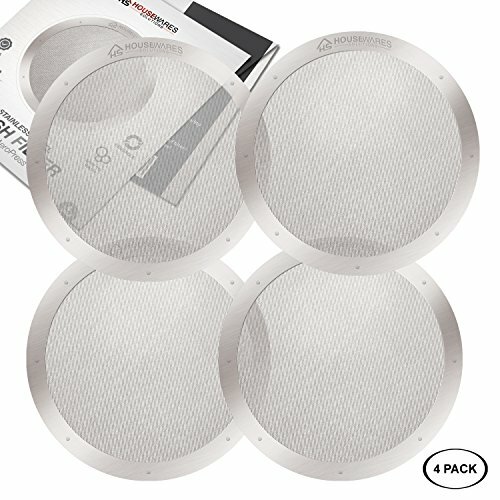 Unlike disposable paper filters which rob your coffee of essential oils and nutrients, these stainless steel mesh filters allow for the passage of healthy oils normally filtered out by paper filters. "Provides a better tasting AeroPress experience because essential oils pass through...no more running out of filters!!" • It is also light weight, very sturdy and fits well in your AeroPress. • Simply adjust the strength of your coffee by using different blends or grinds. These filters work great with finer grind sizes (like turkish or espresso) that require less steep time. • You can store in your AeroPress between uses. Can be used when wet or dry. Click "Add to Cart" and start enjoying your coffee the way you like today. PRECISION LASER-CUT FILTER - Fits older and newer generation AeroPress Coffee makers. No more grounds ending up in your cup with our reusable stainless steel mesh filters for Aeropress coffee maker. It is made of BPA free 18/8 (304) stainless steel, which allows the coffee oils to flow through for a richer, better tasting coffee. ENHANCED TASTE & FLEXIBILITY - Unlike disposable paper filters which rob your coffee of essential oils and nutrients, the MESH allows for the passage of healthy oils normally filtered out by paper filters. It is very sturdy, easy to pack and carry which makes it ideal for camping. Housewares Solutions mesh filter for AeroPress is an excellent choice if you are looking for a fast, easy, inexpensive, yet tasty way to brew coffee at home, office or on your upcoming weeklong camping vacation. EASY TO USE, CLEAN & STORE - Brewing fresh coffee with our mesh filters could not be easier. Never buy or discard another coffee filter again. Just wash under tap water for a few seconds after use. You can store in your AeroPress between uses. Our filters can be used when wet or dry. REUSABLE AND ECO FRIENDLY - Our MESH FILTERS provide a cost effective way to brew your favorite coffee while saving the environment. Reduce the number of disposable paper filters thrown into the garbage. No need to buy paper filters that create waste and reduce the taste of your coffee by absorbing all the essential oils and nutrients. These filters work great with finer grind sizes (like turkish or espresso) that require less steep time. 100% LIFETIME MONEY BACK GUARANTEE - Features Medical/100% Food-Grade (BPA free/lead free) construction, and excellent water dispersion system. You'll save the most and limit trash with our stainless steel MESH FILTERS. However, if you are not happy with it, feel free to return it and get your money back. If you have any questions about this product by Housewares Solutions, contact us by completing and submitting the form below. If you are looking for a specif part number, please include it with your message.